Adult males make a unique loud musical trill with their wings in flight. Description: Metallic green above. Rounded tail. 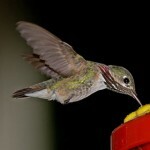 Male has rose red gorget and white underparts with green sides. 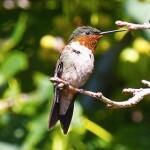 Female has speckled throat; pale cinnamon flanks; and broad green tail shows rufous on outer feathers. Habitat: Migrants can be found in open plains, forest clearings, and mountain parklands. 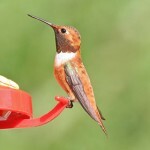 Sometimes appear in gardens and at hummingbird feeders. Where in Nebraska: Occasional fall migrant in extreme western parts of the state. Most sightings are from Dawes and Scotts Bluff Counties. Field Notes: Known to nest in the same tree or bush year after year,a phenomenon known as philopatry. 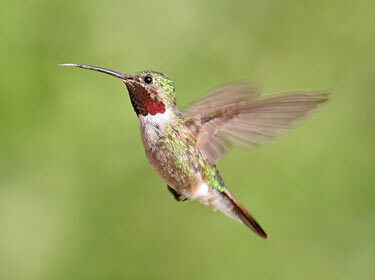 Fun Facts: One female Broad-tailed Hummingbird holds the North American age record for hummingbirds at 12 years old.